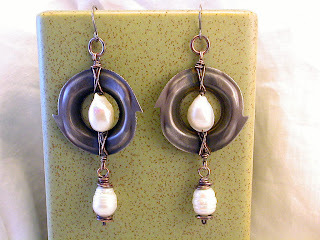 In the spirit of Re cycle, and Re purpose I came up with these earrings that use small discarded industrial cutting disks as an "out there" and on the Edge design element. Steel disks, copper wire and freshwater pearls.. the feel is Post Apocalypse and a Beyond Thunderdome style... the disks are a matching pair that fit together and work in a scissor fashion rather then being a sharp edged blade... My Dad, who passed quite a while ago worked for a comapny that designed and machined Industrial blades like these and all kinds from Humongous ones used in the rubber and paper making and baking industries to tiny blades for precision work in surgery. 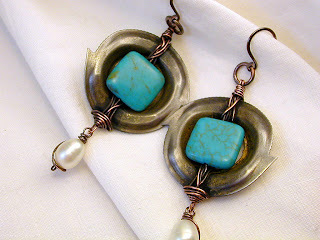 The silver colored steel wheels were antiqued and then wrapped and embellished with wire stones and pearls. I then brushed and buffed the high points to bring out depth and contrast. A beautiful pewter like luster with a nice oxidized mottling on the steel give a lot of visual texture and interest to these Indie Punk, Post Apocalypse Goth style earrings. 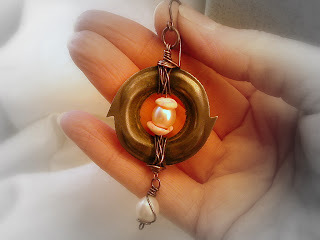 at www.AtabbycatArts@etsy.com and I have lots of different ideas on varying the themes and style and look. I wore the pair I made for myself to meet 2 new members of my family last night and I got a "Whoa Those are Cool!" from the 20 to 30 year olds in the mash of family. I think Aunty Entity would more then likely approve! Dyed magnesite square beads and wrapped freshwater pearls. Pink "puka" shells and wrapped freshwater pearls. Oooooo Scary?? Not to me!!!! Saki Sox She really Rocky Rocks!! !